The Fairey Firefly was a two seat carrier borne fighter and anti-submarine aircraft. Designed and built by the Fairey Aviation Company the Firefly entered service with the Royal Navy in late 1943 and saw active service in both the European and Pacific theatres. Following the creation of the Royal Australian Navy Fleet Air Arm in 1948 fifty Firefly’s were acquired and operated by 816 and 817 Squadrons embarked in the new aircraft carrier HMAS Sydney. Sydney arrived in Australia, from the United Kingdom, in May 1949 and the squadrons were based at the Naval Air Station - Nowra when not embarked in the carrier. Ultimately the RAN would acquire a total of 108 Firefly aircraft with further batches delivered in December 1950 and March 1953. The Firefly were equipped with four 20mm Hispano cannon, could carry 500 lb bombs and were known to be a sturdy aircraft capable of long range and well suited to carrier operations. It was powered by a Rolls-Royce Griffon liquid-cooled piston engine with a three-bladed propeller . The pilot's cockpit was over the leading edge of the wing and the observer/radio-operator sat aft of the wing trailing edge - positions which gave better visibility for operating and landing. In mid-1951 the RAN was advised that Sydney would deploy to Korean waters to support United Nations operations in the Korean War. 817 Squadron was embarked in Sydney along with the two Sea Fury squadrons and sailed from Australia in late August 1951. The RAN aircraft flew their first sortie on 4 October 1951 and over the next four months 2366 sorties were flown from the carrier. A total of four Fireflys were lost, or damaged beyond repair, on operations in Korea before the last sortie was flown on 25 January 1952. One of the Firefly's was lost overboard in October, during Typhoon Ruth, and the dramatic loss of WB393, shot down on 26 October 1951 near Chaeryong, North Korea saw her two man crew rescued by Sydney’s helicopter while under enemy fire and flown to Kimpo Airfield in failing light and low fuel. No Firefly aircrew were lost during Sydney’s deployment to Korea. Following Sydney’s return from Korea 817 Squadron returned to Nowra for recuperation and then commenced working up again for possible return to Korea. The aircraft carrier HMS Vengeance was loaned to the RAN in November 1952 and 816 Squadron was embarked. 817 Squadron embarked in Sydney for the voyage to the United Kingdom for the coronation of Queen Elizabeth II in 1953. Following the signing of the Armistice, on 27 July 1953, hostilities ceased on the Korean Peninsula but post-Armistice maritime patrols were required to ensure that peace was maintained. Sydney deployed to Korean waters again with Fireflys from 816 Squadron embarked from November 1953 until June 1954. No Fireflys were lost during this deployment. The Firefly was phased out of service in 1955 as the Fairey Gannet came into use and both 816 and 817 Squadron was decommissioned at Nowra on 27 April 1955. Four Fireflys were converted to dual cockpit aircraft for pilot training and another two to target towing aircraft for fleet support duties and operated variously by 723, 724 and 725 Squadrons. 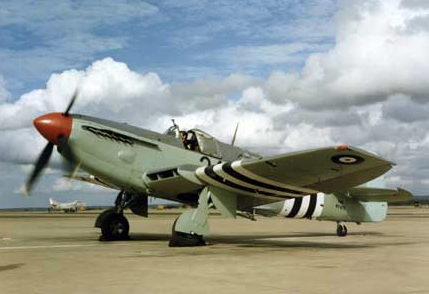 The last recorded Fairey Firefly flight was on 1 March 1966. Left: A Fairey Firefly about to land on the aircraft carrier HMAS Sydney (III) during the Korean conflict (note the black and white stripes on wings indicating the aircraft was serving under United Nations command in Korea). Right: A Fairey Firefly launching from HMAS Sydney (III).